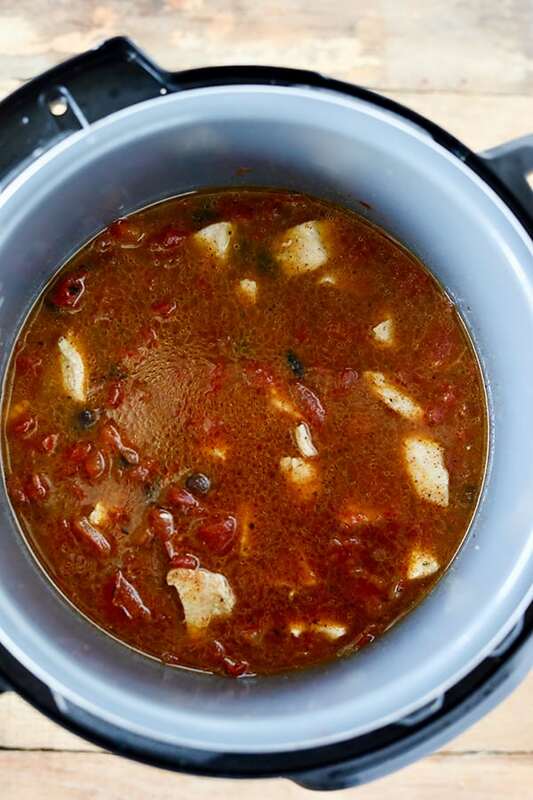 You can see more of my Instant Pot recipes here. 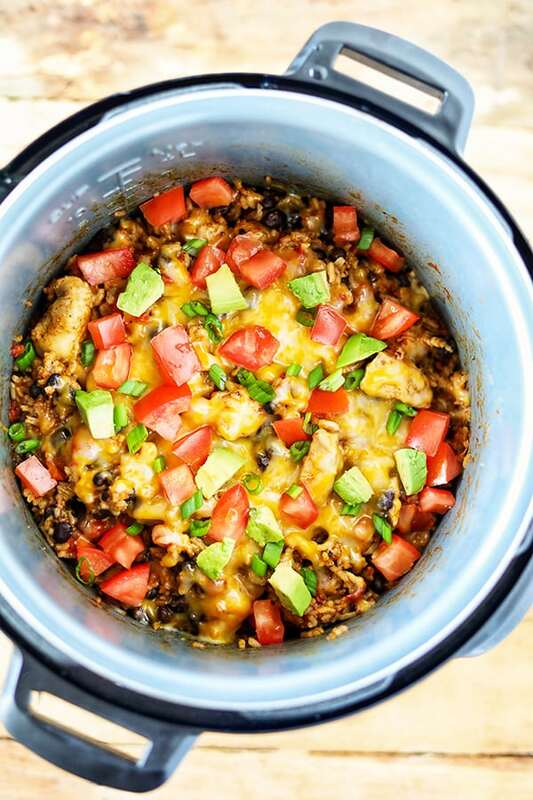 Find the Slow Cooker Chicken Burrito Bowl here! 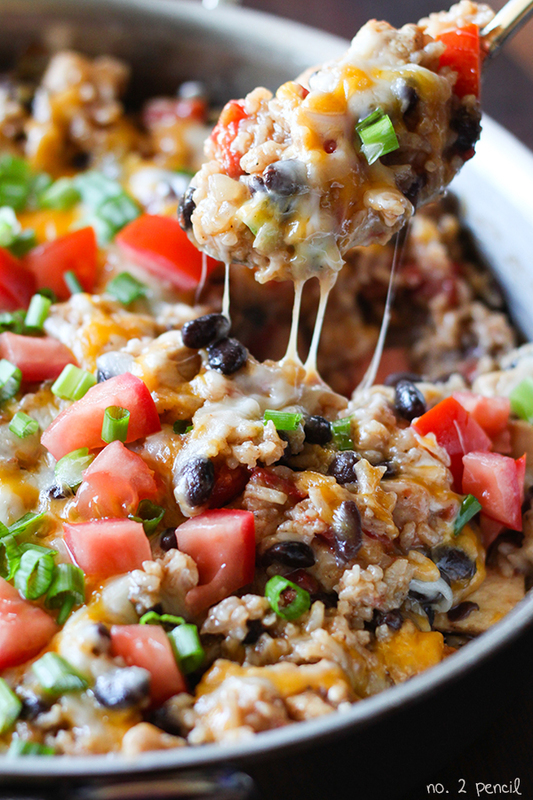 Find the skillet One-Pot Chicken Burrito Bowl here! Just got my Instant Pot and this was my second recipe I’ve made in it. This was delicious and easy (and healthy?) – a big hit with my family. I served it in corn tortilla boats with various garnish on the side. 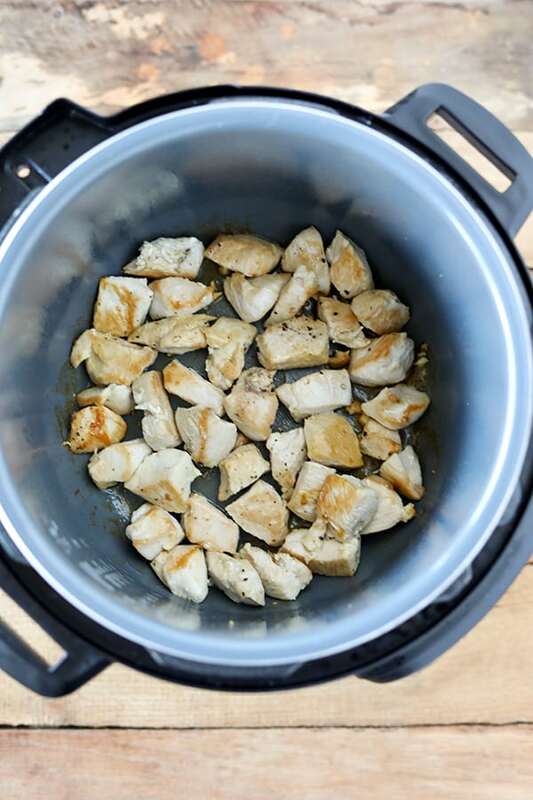 Had one question about step 1 in the instructions – “Add 1 tablespoon of olive oil to Instant Pot and hit Saute button, then hit adjust button to set to More.” – – “More” doesn’t do anything on my Instant Pot except increase time but there was no reference in the instructions on how long (in minutes) to Saute. It all worked out – and as mentioned, was delicious. Will make this again. Happy to have discovered this recipe and your blog! You leave the lid off and watch the chicken as it browns. Remove when there’s a nice color to the pieces but don’t fully cook. This is same as browning in a skillet. I sauteed my pieces for about 3 minutes, flipping as they browned. Do you think you could do this with frozen chicken? If so, how much longer should I cook it? I’m sorry, I haven’t cooked it from frozen. I am new to using the Instant Pot and cannot have rice. Can you suggest how much liquid to use if I am not using rice or substituting it with frozen riced cauliflower? Thank you! You could probably reduced to 1 cup of chicken broth and serve over the cauliflower. Let us know if you try it and what ends up working for you! How would u adjust this recipe if I wanted to use brown rice instead? I haven’t tried brown rice with this recipe in the instant pot yet, but if I do, I will update the recipe with the info. I did it with brown rice tonight – I needed to cycle it three times to actually cook the rice! [3 x 7 minutes of pressure]. We haven’t eaten it yet – needed to feed the little one something else so she could go to bed, so we will eat it tomorrow. If we like it, I would probably do 15 minutes at pressure and a slow release? I haven’t tried it with brown rice, but I think 15 minutes is a good starting point for testing! Set to high pressure for 22 minutes equal parts rice to h2o. This was a big hit with my family. We ate it with some tortilla chips on the side. I couldn’t find canned fire roasted tomatoes so I used a can of Rotel and it worked great. Only tweaks I will make next time is I will either add chopped jalapeno or a few chopped chipotle peppers with the onion to make it a little spicy and maybe add a handful of frozen corn and some chopped cilantro. Great dish! This was really good! I made it for my neighbor who just had a baby. It makes a ton so we had some to spare. I served it with tortilla chips! Soo yummy! I made this recipe with brown rice and used only 1 cup of cheese and yet this stuff is still like crack. I’m eating it cold for breakfast!! 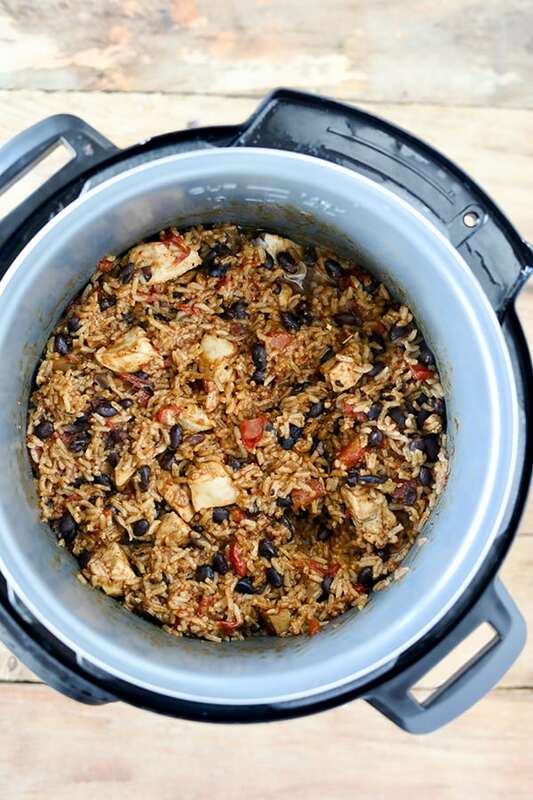 My new favorite instant pot recipe!! Thankyou so much!! I love this recipe. I have made it multiple times using chicken and beef. knight I thawed out pork instead chicken. That’ll teach me to pull meat from the freezer at 3am. Anyway we are having pork burrito bowls tonight for supper. Needed a little more salt but no biggie. This recipe was awesome. I’ve made it twice already. Soo easy and sooo delish!! This was so delicious! I made it as a “dump and go” meal with whole chicken breasts and some precooked brown rice (we just cook a whole bag at a time and keep for the week) and it was fantastic! This was delicious! My family asked for it two nights in a row! We have a larger family though, if I halved or even doubled the recipe would all the ingredients be halved/doubled? Loved this recipe. Very easy and filling. I added a small can of chopped chilies to add a little heat. I have been using the Instant Pot for almost a year now. This has become my husband’s number one favorite! Thank you for sharing this delicious recipe. Question:You list 3 T of oil but only put in 2T. One w/browning the chicken and one with browning the rice. Which is correct? I used 3 but would prefer to use 2. You list onion powder but don’t show it being put in w/the other spices. Which is correct? I did use the onion powder and will always use it since it turned out just to our tastes. I don’t normally leave replies on recipes, but this was so good I had to come back. I added fresh garlic and a chopped pepper, but other than that I made the recipe as written. I don’t even like Mexican food and this was fantastic! I’m making it again tonight and adding a can of corn. It’s definitely a hit in my house! I haven’t tried it, but I have seen some comments that people get the burn notification when doubling. I would try it in an 8 qt Instant Pot. I’m going to try this recipe this week, except use beef instead of chicken, for Mr Picky (my hubby) who doesn’t like chicken. I know, I know….who doesn’t like chicken??? 🙂 Will let you know how it works out. I’m excited to try it. Thanks! I made this tonight with some left over carne asasa meat from street tacos last night. I used beef broth instead of chicken broth. Super delicious!! 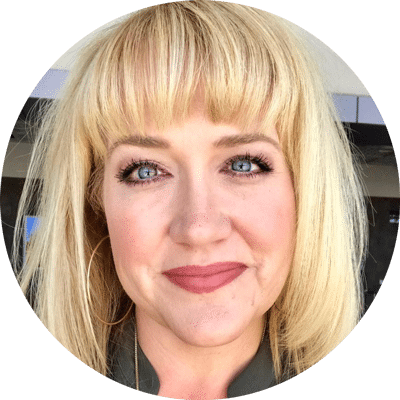 Do you have nutritional information on this (calories, etc…)? Thanks! This turned out superb! One minor change, due to pantry ingredients, I used a can of fire roasted Rotel with cilantro and lime instead of plain fire roasted. I think it was a good switch up. I also had fresh limes and ciilantro on the table as well as the add ons that you mentioned. My son and I both loved it and can’t wait to eat the leftovers tomorrow! Thanks for a great recipe. Tried this for dinner tonight. SO delicious! We doubled it in our 8qt Instant Pot. We added extra toppings that were delicious with it as well. Onion, salsa, Anaheim peppers, cilantro, jalapenos, along with the green onion, sour cream, tomatoes, and guacamole. Some of us had it on flour tortillas as well. We will for sure be making this again! Thank you for the yummy and easy recipe! 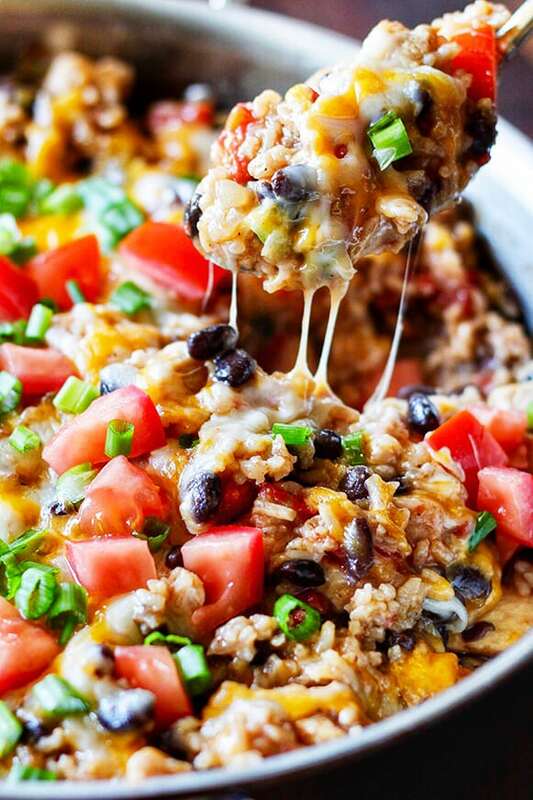 I’ve made this twice, the first time I followed the recipe except just added a pack of taco seasoning instead of the individual spices and it was excellent! Just made it again tonight this time with shaved steak, also added a can of Rotel diced tomatoes and green chillies, with the taco seasoning and red pepper. My husband liked that even better than the first time. As for the person who said it was too much liquid for the amount of rice… well mine came out perfectly cooked, so if you make it follow the recipe with the liquid.